This is one of my favorite non-Disney animated films. I love how they modeled the feisty heroine Anastasia after Audrey Hepburn, and the music was phenomenal! I also thought Dimitri was really cute as the leading man, and John Cusack did a terrific job of voicing him. The whole story was enchanting too, even though sometimes the characters' facial expressions weren't the best. Disney has this nailed, but not being a Disney creation, this aspect was less than stellar in the film. It was a minor flaw though. My favorite songs are "Journey to the Past," and "Once Upon A December." I also LOVE the theme song "At The Beginning" performed by Richard Marx and Donna Lewis. It applies to many of my favorite couples, and I really love the lyrics. 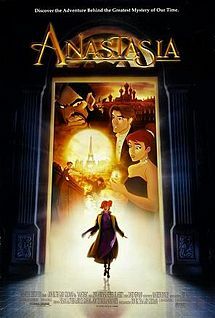 Any other Anastasia fans here? This is the place to post and have fun! A beautiful film, one of my favourites. I don't know why it took me this long to reply to this thread. I also enjoyed the movie, though I don't think comparing Anastasia with Audrey Hepburn is justified really. That is not to say Anastasia's not charming in her way, but the style isn't the same. Still, the animation is beautiful and the scary-adventurous part of the film was very well done. Some of the comedy felt a little forced, but other bits were good. Audrey Hepburn never occured to me I must admit, though I assume that's because Meg Ryan did the voice and I thought she had been styled after her (in mannerisms if not in looks). My favorite song in the movie is "Journey to the Past," though I liked the animation sequence to "Once Upon A December." I love all the songs, did you prefer the versions in the film or the 'pop' version in the end credits? I somewhat unusually liked both. ^ I actually loved both versions of the songs too. Also, I didn't realize that Pooka means *guiding light* but it makes sense that Anastasia would name the doggie this, because he helped to guide her path when she performs "Journey to the Past." I read this bit of trivia somewhere, and thought I would share with the rest of you. That's interesting, a pooka is also a name for a ghost or mischievious or friendly spirit which is what I always took the reference to be, because he came out of nowhere but helped her along. ^ Oh cool! You taught me something new today. And yeah, this description fits the puppy's mischievous personality as well. Last Edit: Jun 23, 2015 22:25:55 GMT -8 by Shaliza: Edited for content and spelling. Yeah, I also heard once Pooka means some kind of guiding spirit. You know, after seeing the movie again after a long time, I kind of wondered how Dimitri and Vlad got to be friends. Vlad was a member of the royal court (so he said, and I think it's true, because how else did he know Sophie personally?) and Dimitri was a kitchen servent. So how did they end up bonding with each other? Hmm good question. Well Dimitri seemed to be the 'goto' guy, I'd guess he came up with the scheme and took it to Vlad? That's probably true, but what I meant was there was a major difference in their social status, so how did the connection between them form? My guess is when the empire fell Vlad had to adjust to a whole new lifestyle, so Dimitri might have taught him some survival tricks (that's probably how he'd see them, it's actually dishonest living) and probably got him out of a few tight spots, either when Vlad had to face the wrath of the people who opposed the Czar, or when Vlad had to do without servents and fend for himself. That's probably how they ended up becoming friends. That seems reasonable, I just meant that if Vlad was struggling and Dimitri brought him a plan, he would listen to him when he might not have before. Yes, I think you're right here, because Vlad otherwise seemed the more honest of the two of them. He did want to drop the act when he realized Anya had found her family, while Dimitri needed more persuasion. Interesting discussion about how Vlad and Dimitri might have become partners in crime. I always thought that after the Czar was killed, that all the members of the imperial court fell on hard times, and lost their servants and such. Perhaps Vlad found Dimitri in the palace ruins and decided to take him in? Dimitri could have been his page, kitchen boy and what not, and they could have struck a bargain that Vlad would provide a home, while Dimitri would be in his service.